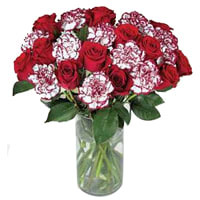 Make their special day unforgettable by sending this Attractive Bunch of Fresh Roses and Carnations. The radiating glow of these mixed flowers recalls before our eyes the image of a gorgeous sunrise. Deliver this Eye-catching floral gift and bring a sense of heavenly bliss to your loved ones. Send this nicely presented gift of Stunning Bouquet of Carnations and Roses and let someone know that you have feelings for him/her. Send this nicely presented gift of Big Stunning Bouquet of Carnations and Roses and let someone know that you have feelings for him/her.